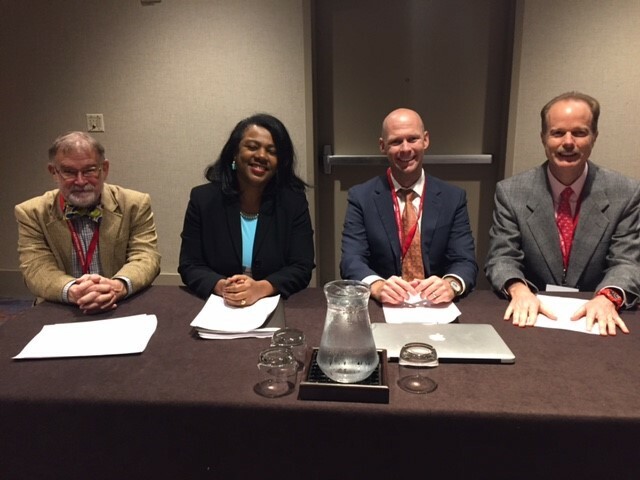 Director of Honors and Professor Dr. Jonathan Thorndike recently co-presented at the 52nd annual National Collegiate Honors Council Conference in Atlanta, Georgia. Thorndike and representatives from Nashville’s recently created Local Honors Consortium shared the process of creating the group, benefits of a collaborative effort, activities and events hosted and best practice alignment. Presenters included Fisk University Honors Program Director Patrick Fleming, Tennessee State University Honors College Director Coreen Jackson, Lipscomb University Honors College Director Paul Prill and Thorndike. The Honors Council Conference highlights student and faculty research presentations from across the nation and provides training and development for honors program administrators. The conference theme, “Just Honors”, explored how faculty and students can address the issues of access, equity and technology as key partners in the community. “Every presentation at conference leaves an impression on the honors network. NCHC’s 2017 conference experience includes opportunities for participants to challenge their understandings and provide innovative solutions for the communities at large,” said Mary Beth Rathe, NCHC Executive Director. The National Collegiate Honors Council is a non-profit organization whose mission is to support and enhance the community of educational institutions, professionals and students who participate in collegiate honors education around the world. NCHC members total nearly 900 institutions from the United States and around the world. Professional and student memberships are available. More information is available at nchchonors.org.